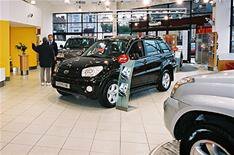 Inchcape in talks with bankers | What Car? Shares in car dealer Inchcape fell yesterday, as news emerged that the multinational company was in talks to raise more capital to bolster its finances. The talks, concerning a share issue, come after the company warned of 'an unprecedented decline' in its sales markets, which include Australia, Belgium, China Britain and Russia. The company's shares yesterday closed down 6.2% at 42p. Car dealership de Vries was yesterday put into administration, resulting in 130 jobs being put at risk.